This more modern version of RS-31 belt. It have better durability and weight. 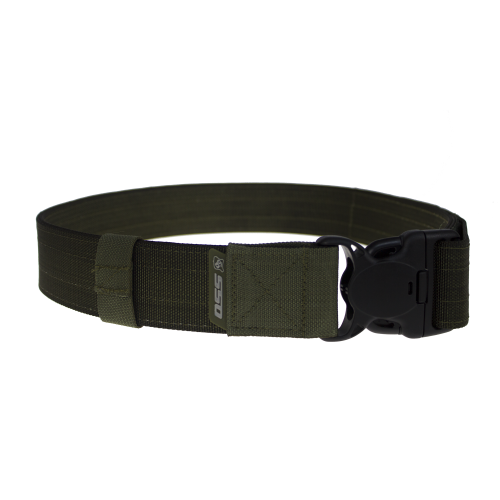 The belt special belt for carrying equipment. Equipment (bags, cases of various types) are attached to the belt via shlёvok or metal hooks - clips with a sliding lock system ALICE. The belt is made of stiff polyester tape width of 50 mm and a thickness of 2 mm. Sheathed tape on the inside of soft textile fastener such as "Velcro" and is enclosed in. Belt fastens with QUICK castle polymer strength. The free ends of the belt are threaded into the adjustment slots polymer castle, adjusted in volume and fixed rigid textile buckle. This model has sizes, If you`re planning to use it with SMERSH ,warbelt or bothly with armor- take this fact into account,please.